R est—Rest and stay off the injured foot or ankle until it is better or examined by a health care professional. Avoid walking, running and other vigorous activities, such as playing sports, as they may cause the injury to be aggravated and become much worse. I ce—Ice usually should be applied to the injured area right away and re-applied for 10-20 minutes every hour or so as tolerated for the first 24-72 hours, or as more specifically prescribed by a doctor. The reason for this is that the cold ice causes any inflation to decrease. We have also found soaking the foot and/or ankle in cold, icy water for brief periods is of great benefit, again as prescribed by your doctor. C ompression—It sometimes helps to wrap an elastic bandage (often called an Ace Wrap or Bandage) around the injured foot or ankle. The bandage should be wrapped snug, but not too tight or snug, as you never want to cut-off proper blood circulation. E levation—It usually helps to elevate the injured foot and/or ankle to decrease swelling. Typically injured persons use soft, comfortable pillows to elevate the foot and/or ankle. It is usually advised to elevate the affected area above one’s heart for maximum benefit, again subject to doctor’s orders. Did you notice that the first letter above of R est, I ce, C ompression and E levation were all in bold print? The reason for that is because they form the acronym “RICE ”, which may help you to remember the things to do to treat an injured foot and/or ankle if ever needed. As already stated in the previous section entitled “Foot Injury Explained,” one should have an injured foot or ankle examined by a doctor and probably X-Rayed and perhaps scanned with an MRI. 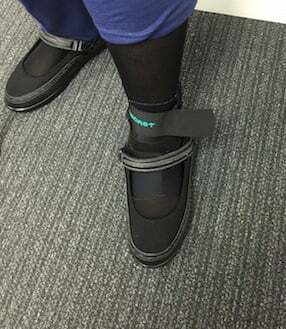 Special orthopedic boot used for broken foot to promote healing and to prevent further injury to broken left foot. Estimated time of use eight (8) weeks. If a fracture is discovered, your medical doctor or podiatrist may attempt to fix the fracture by a process called “reduction” of the fracture. Reduction of the fracture means lining up the ends of the fractured bones so they align and can heal properly. This procedure is usually done under a local anesthetic to numb the affected area prior to commencing the procedure. If the fracture is more complex so that the ends of the bone do not stay in place after the reduction procedure, then this is referred to an “unstable” fracture and surgery may be required to fix such fractures. In such circumstances, medical doctors/surgeons and qualified podiatrists may use screws and plates to repair and fix such unstable broken bone. Another kind of fracture that is treated is called a “stress fracture.” Such fractures are usually treated with rest and immobilization. One should stay off the injured area until advised that healing is complete. In such situations, crutches, casts and/or special “boots” are used to immobilize and take pressure off the injured areas. By contrast, sprains require less intrusive treatment, but also are often treated with rest and immobilization. 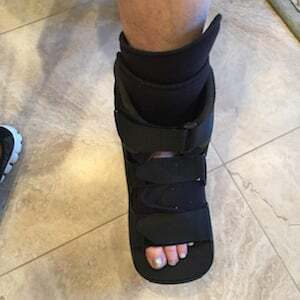 Depending on the severity of the sprain, one may return to active daily life relatively soon or one also may need to use a special “boot”, soft cast and/or crutches for a period of weeks or even months. In addition, often oral medications to relieve pain, swelling and inflammation may be used, subject to one’s doctor and tolerance for same. These medications are often referred to as anti-inflammatory medications. Typical medications are Advil, Motrin and Ibuprofen. Some, due to a low tolerance for such medications, may find some relief from the milder Tylenol. What if You Suffer From Complex Regional Pain Syndrome (CRPS)? If you suffer from Complex Regional Pain syndrome (CRPS), a severe chronic pain condition that can affect any part of the body including your foot, due to a crush like injury, car accident or any other accident, you should see appropriate medical specialists, such as foot specialists, orthopedic specialists and/or pain management specialists, as more fully explained in our previous section entitled “Foot Injury Explained.” Fortunately, our personal injury lawyers and legal team can assist injured persons with such medical consultations. If you or anyone you care about suffered any foot injury in any car, motorcycle, truck or other accident, after obtaining necessary initial medical care, which we can help you with when requested, we urge you to contact us right away for an absolutely FREE consultation. If you had a foot injury, our personal injury & wrongful death accident lawyers offer an absolutely FREE & CONFIDENTIAL case consultation and evaluation and we work on a contingency fee. That means there is NO fee until you WIN and then the fee comes out of the recovery usually paid by the other parties’ insurance company and not out of your own pocket. Simply click here for our quick and easy contact form to tell us about your foot injury or other injury accident.